With less than 36 hours to go until the much-discussed 'sequestration' deadline, the Senate blocked a pair of competing bills to prevent the broad, automatic cuts from taking effect. Neither measure was expected to reach the 60-vote threshold required to move a fix forward, with Republicans and Democrats taking up the legislation largely for show the day before the cuts are slated to kick in. The Republican sequester ‘replacement’ proposal -- which would have offered the administration more authority to allocate the spending cuts -- was killed with a vote of 38 to 62. The White House had threatened to veto that bill in the unlikely event that it passed. A Democratic plan focused on closing tax loopholes and raising some taxes garnered 51 votes, short of the 60 necessary to move it forward. The Daily Rundown's Chuck Todd talks about the lack of progress between Congress and the president to avert the sequester. With both sides still deadlocked over how to address the deficit, congressional leaders will meet with the president at the White House tomorrow. President Barack Obama lambasted Senate Republicans in a statement, saying that GOP opposition to the Democrats' bill stood in the way of a solution. "Even though a majority of Senators support [the Democrats'] approach, Republicans have refused to allow it an up-or-down vote - threatening our economy with a series of arbitrary, automatic budget cuts that will cost us jobs and slow our recovery," he said. "Instead of closing a single tax loophole that benefits the well-off and well-connected, they chose to cut vital services for children, seniors, our men and women in uniform and their families," the statement read. "They voted to let the entire burden of deficit reduction fall squarely on the middle class." Earlier Thursday, competing press conferences, lawmakers from both parties continued to lay blame at each other's feet as they acknowledged that the across-the-board reductions to the nation's military and domestic spending programs are inevitable. Senate Majority Leader Harry Reid olds a news conference at the U.S. Capitol on the eve of the budget sequester Feb. 28, 2013 in Washington, DC. House Speaker John Boehner argued Thursday that the budget ball remains in Democrats' court, a case he says he will make again tomorrow in the meeting with Obama. "My message at the White House will be the same that I'm telling you today,” he said. “It's time for them to do their job and to pass a bill." 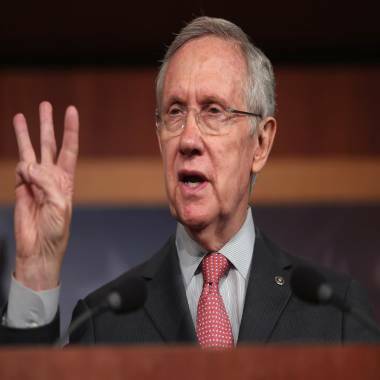 Senate Majority Leader Harry Reid responded that Republican calls for Democratic action "take a lot of pizzazz." "They've done nothing," Reid said, saying that House Republicans are hiding behind the lower chamber's now-expired passage of budget measures last year while failing to allow compromise legislation to come up for a vote. The weariness over the sequester jockeying – which promises to drag on for weeks as the fight shifts to future deadlines for greenlighting federal funding -- even spilled over into the Senate chaplain’s opening prayer this morning. Mentioning the cuts in his invocation, Senate Chaplain Rev. Barry Black prayed "Rise up, oh God, and save us from ourselves." NBC's Mike Viqueira contributed to this report.